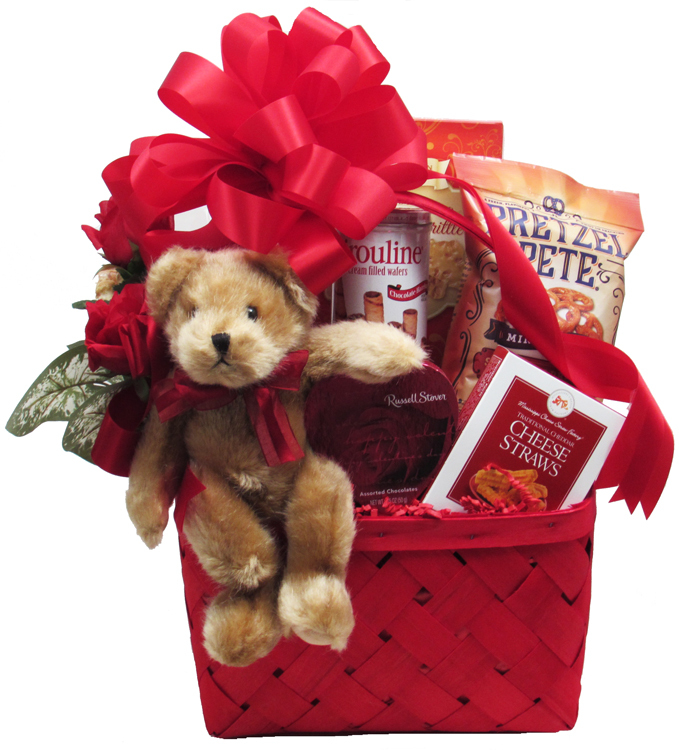 Send your loved one this adorable plush bear named Lil' Sebastian, along with lots of goodies! This red handmade wood basket (made in America) with a handle, is filled with Russell Stover's Heart Shaped Box of Chocolates, Cheese Straws, Chocolate filled Wafer Rolls, Gourmet Popcorn (Almond Pecan Crunch, Cranberry Walnut Crunch, Dark Chocolate with Sea Salt Crunch, or Caramel & Cheddar Jalapeno), Pretzel Twists (Salted Caramel or Smoky Barbeque), a box of Peanut Brittle ...and of course, "Lil' Sebastian" the cuddly bear! Wrapped in crisp clear cellophane and topped off with a big red Handmade Bow. Red silk roses and greenery are added. Includes a Handwritten Greeting Card. Finished wrapped design is approx. 23"H x 14"W x 8"D.
NOTE: We are out of this basket in red, we can design in the same basket, but in a natural color.